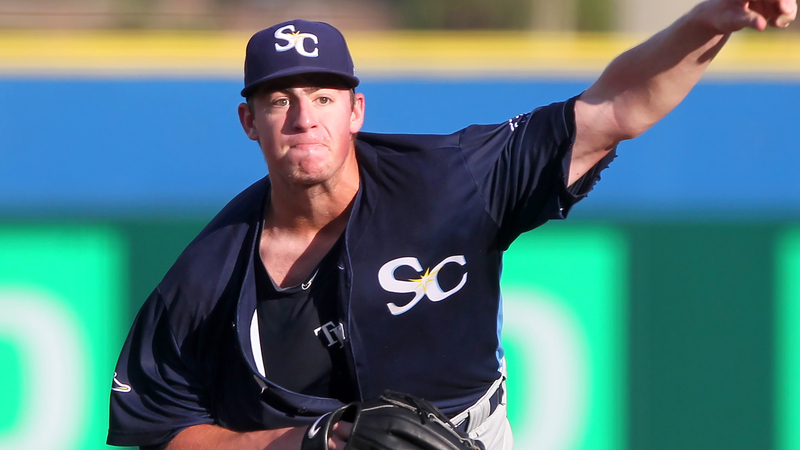 Rays fans might not see Brendan McKay in the field this season, but don't think the team or its young star have given up on two-way aspirations. Tampa Bay has a new plan for its No. 3 prospect this season. McKay will pitch, and following a day off, serve as his team's designated hitter until his next scheduled outing. McKay played 27 combined games at first base between Class A Bowling Green and Class A Advanced Charlotte last year. "We were just trying to figure out a way to take some stress off my body," McKay told MLB.com. "The goal is to bring [the hitting] up to where the pitching stands." Baseball's No. 29 overall prospect pitched in the Midwest and Florida State Leagues as well as the Rookie-level Gulf Coast League on rehab assignments. He posted a combined 5-2 record with a 2.41 ERA, 103 strikeouts and 14 walks over 78 1/3 innings in 19 outings (17 starts). That came after a six-start stint with Class A Short Season Hudson Valley in his Draft year in 2017. McKay put up a 1-0 record with a 1.80 ERA in his professional debut. At the plate, the Louisville product hasn't been quite as prolific. McKay batted .223/.349/.376 in 36 games for the Renegades and followed with a .214/.368/.359 line in 56 games through three levels last year. The 2018 season also featured two trips to the disabled list with oblique issues. "It was disappointing for the fact that I missed a month and some change," McKay told MLB.com. "I took it as finding out a lot about myself and there were some good things to take away and some bad things. "They're learning just as much with me as I [am] with myself. I'm learning what it takes to keep myself healthy through the season, how to be prepared, be focused and prevent injuries. Managing all that stuff is tough." While they won't be sending him into the field, the Rays still plan on McKay reaching the big leagues as a two-way player. The new strategy got a warm reception from the player. "I'm fine with it," he told MLB.com. "It might take a little bit of an adjustment since I won't be going to first base every couple of days and I'll be sitting in the dugout a little bit more, but I'm just taking it how it is and moving on." The 23-year-old has considered the possibility of choosing one side of his game in order to go down an expedited path to the Major Leagues -- if it comes to that. "I've thought about it," McKay told MLB.com. "It's like if you're in Triple-A and the team asks if you want to pitch in the big leagues the next day, it's not like you're going to say, 'No, I'll stay in Triple-A.' It's all just situational." McKay likely will be sent to Double-A Montgomery to begin the 2019 season.